If I was to write letters to the people who have heard the gospel from my lips, I wonder if I could say what Paul said. For we never came with words of flattery, as you know, nor with a pretext for greed—God is witness. Nor did we seek glory from people, whether from you or from others, though we could have made demands as apostles of Christ. But we were gentle among you, like a nursing mother taking care of her own children. So, being affectionately desirous of you, we were ready to share with you not only the gospel of God but also our own selves, because you had become very dear to us. As I read from Paul's pen, I imagine what it must have felt like to know he and his little missionary band were "affectionately desirous" of me - ready to share the Gospel and their very lives because I was so dear to them. Hm. These words come to mind: treasured, valued, loved. Though I'm sure you would make assumptions about my extrovertedness if we met, relationships aren't something I instinctually sacrifice to develop. Often (ahem, too often) I would rather choose a book or a journal or precious time writing over developing relationships. I remember moving to Austin, Texas after I graduated from college. After living with college friends for four years, renting a room from a nice couple in the suburbs was quite the adjustment. I read a lot of books those first few months. Sometimes, I would go to BORDERS to see how many books I could finish on the overstuffed chair in the biography section (I was on a bit of a budget). But, I'll never forget the phone calls I would receive from my new Austin friends. It would be 6 pm on a Thursday night - prime time to dig in to my newest biography on Blaise Pascal - and I would get a call from Katelin or Stephanie or Christine. Selfishly, I knew Blaise Pascal was safe - that he wouldn't make drama or ask much of me. There was something else, though, that stirred me to say, "...Sure! I'll meet you there in 15 minutes." That something else was hidden in my DNA, woven into my identity by the hand of God while I was still in my mom's tummy. We were made for relationship. We were designed to enjoy and share and give life in relationship. Christ Himself proved it was a good design when He became flesh - intentionally walking into humanity as a human who reached out to serve, love, give, and bless. He did not stoop to walk in a flawed design. No, He lived life showing us how it was truly designed to be lived. Being human is not an unfortunate mistake. God's design is good and the life of Jesus reveals it to be beautifully so. And how is it that Paul can write with such deep love and sacrifice for the people with whom he shared the Gospel? Because Paul had experienced being treasured and valued and loved by God. Paul was overwhelmed by the amount of grace and mercy he'd received and wanted nothing more than to be spent living as Christ. Treasuring Christ above all else means sharing the treasure. There is a way of sharing the gospel that makes people wish it was true, even if they believe it's not. At least, Tim Keller thinks so (The Faith to Doubt Christianity). There is a way of sharing the gospel that draws people in first because it's beautiful. Not at first because it's reasonable or socially responsible or sweet sounding, but because it is simply beautiful. I know we can do battle about beauty - what it is and who decides - but that's for another day (and a day that's already been). Today, I'm trying to be a student of this kind of gospel sharing. I'm trying to understand what it means to put the beauty of redemption on display - to draw back the curtain on the glorious story acted out on the living stage. I'm trying to remember what it felt like to see the hero die for the villain... and the horrible knot in my gut when I realized the villain was me. To share a beautiful story, one must believe the story is beautiful. And for that, I must go and sit in the theatre. I must watch wide-eyed and remember every interaction and every awe-inspiring stage direction. I must hang on every word because every time I know the villain is doomed, but every time the story plays out opposite what I am sure I know. And it is beautiful. To share a beautiful story, one must first believe the story is beautiful. There is a way to share the gospel that makes a person sit on the edge of their seat and hang on every word. There is a way to share the gospel that makes one appreciate and even wonder at the beauty so much that one wishes it was true. I want to learn this way. And so I must go again to the theatre. Have you ever had a string of days where putting one foot in front of the other seems harder than it should seem? I mean, have you ever been frustrated at being frustrated? I'm just wondering, I guess. Here are some things that are taking my mind off my feet this week. I hope it pushes you to think harder or differently ... and then I really hope that your knowledge grows feet. I mean, I hope your knowledge does something because otherwise it's just about puffing up. Do you know Al Mohler? Well, he's kind of a big deal. Anyway, he wrote an article in The Atlantic recently about Helen Gurley Brown's influence on the sexual revolution. It is an interesting piece that speaks to one of the most confused cultural categories (sexuality) of our generation. What I didn’t understand at first (and realize now that I am a recovering theologeek) is that the younger generations are intensely pragmatic. And contrary to what many in the church might assume, their pragmatism is in no way opposed to serious theological thought. Young people really do desire theological understanding. But they want theological inquiry to serve a purpose beyond simply knowing. To this generation, studying theology merely for the sake of knowing is inextricably linked to arrogance. For them, the study of theology isn’t complete until it ends in praxis. They do not abide the last three chapters of Ephesians being severed from the first three. They want to understand how knowing culminates indoing. This piece on contemporary art, "Absolutely-Too-Much" admits that contemporary art can be a hard thing to appreciate, but it remains something to be admired. I like how this article shifts to philosophical implications in contemporary art because, of course, they are connected. "We all had new iphones but no one had no one to call..." Thats a line from the song, "Life's for the Living" by Passenger. Sometimes, on those days when one foot drags as we put it in front of the other, we just have to remember that "life's for the living. So live, or you're better off dead." Sometimes, it's as simple as that. The chorus was like fingers playing my heart strings.It was like a cool glass of something I forgot was my favorite. It was like realizing I stood shoulder to shoulder with an old friend. I know what you're thinking... "that's it? that's all it took?" And, yes. It was that simple. I was standing in the church service this morning with people from El Salvador and Mexico and Guatemala and the chorus came in like a wave on my soul's shore. It is not a new truth - that the Lamb is worthy to receive glory - but it is a truth that feels weightier when felt the world over. This morning I sang it again in the language where I witnessed miracles, the language that made me desperate for miracles. And when I sing about giving Him glory, I do just that. I give Him the glory. With each day, I'm tempted to write another chapter in Ecclesiastes and with each day God gives more reasons to be glorified. And so I sing. Sometimes the simplest phrases can best put all the tangled messes of daily toil into proper perspective. Sometimes the simplest chorus carries with it deep and complex theology about sovereignty and supremacy and hope. Yes. It's that hope I pressed into as I sang with families in the chapel at the retreat center, because we are desperate to give glory to the only One worthy. That was it - one crown of thorns and it crowned the King of forever. So, today, I sang. I sang to give God the glory and I did just that. I've decided I should sing more. I'm between jobs 1 and 2 and it's shaking out to be a day of sifting. This Friday is being sifted until only the too-big pieces remain on top. And what is of most importance is becoming very, very clear. It's normally not so easy to see with an eternal kind of sight. There are coffees to buy and websites to navigate. There are attendance sheets to make and databases to conquer. There are hours to wile away and weekend plans to make. There is an errand to run and another book to add to the pile of those I should read. But, today there is sifting. And after this Friday is shaken, the big pieces that remain have little to do with what I've gained or stored or clocked or typed. The big pieces are eternal things that I cannot manufacture - things that put all other things in beautiful, right perspective. Today, I am praying that my life is about the main thing, that I don't treasure my life more than the main thing, and that all other things will fall through my open hands so that I will cling to what remains. I am praying that I delight in Christ so much that I cannot imagine keeping this delight to myself. In my delight and revelry, in my worship and bust-at-the-seams joy, I am praying I live fully in the freedom His suffering allows so that He may be glorified as others hear the same call to freedom from my lips. Because He is worthy to receive the reward of his suffering. The second time she told me I was really listening. It's like I told you, Care. Being saved is like getting hit by a train. I imagine there are millions of pieces just splattered everywhere... and that's the end of it. Only a miracle - a straight up act of God Himself - could manage to fit those pieces together. Only God could make me whole after a disaster like that. She was talking about salvation and this time I was really listening. I already knew Alejandra's life was a miracle, but hearing her tell her salvation story made me realize how little I had to do with it. It was really always this: she had stepped into the path of destruction and then God stepped in to offer a miracle - a life that is whole. The next thing she said shouldn't have been shocking, but there is always more to learn about salvation. I don't understand how people can have a middle phase to faith. I mean, when you get hit by a train, you either stay blasted in pieces or there is a miracle to make you whole. And that's the truth. There's no "call me, maybe" in this scenario, no lukewarm in this salvation equation. The only way to be sure you are "in" is to think you must be "out" (to borrow from Tim Keller). The only way to experience the highest delight in this life is to know that it is a miracle of grace to experience anything at all. We must never, ever lose sight of that train or the tracks that we tread toward our destruction. We must never, ever lose sight of the magnitude of the miracle that put life in our dead bones. And if you are still on the tracks, blasted into bits by your own doing, know that there is One who desires you do not remain destroyed. And He is the One with the power to do something about it. We've established I'm not a runner (see 'lost in cornfield' story). But I do like to run. I like the the time it gives me to think and I like how all the jostling helps my loose marbles make some sense. I set off for a run the other day and, as is usually the case, decided how long I would run based on my plans for the night. As I considered my route, I thought about why a runner trains. I remembered the first question people asked me after I finished Dam to Dam, "When's your next race?" Everyone assumed I had become "one of those runners" who was always looking for the next race. I thought, "Sure, I'll do it again." But as I mentally mapped out my route (that I'd determined should take me 45 minutes max), I realized why runners sign up for races. I know it's not rocket science, but it seemed pretty profound to me as the loose marbles starting making sense on Duff Avenue. The motivation for training comes from the goals for race day. Then race day happens. And then you sign up for another race. People have told me that you lose weeks of training in days and now I know it's true. A whole lot of training and accomplishment and hard work amounts to little after a few days off. And so, of course, I think about this Christian race we're running. We stretch and train and beat our bodies into submission because we are training for something. And, I wonder if Paul felt the weight of "not having attained it" after every race he finished - every missionary journey and shipwreck and public sermon - he immediately signed up for another. His training built on training and there was never a time where he wasn't preparing because there was never a time he wasn't signed up for a race. I wonder this because I can see the temptation after a race to wait, consider, and "rest" in a way that smacks excuses. When we finish something like a race, we feel accomplished and proud and (in some ways) as if we've arrived. When we believe it's all about us, we will fall hard and fast clinging to the comfortable title of "accomplished" that seals our fate and renders us useless. What a beautiful thing to always have the prize in front of us, to always strain towards what is ahead, to always have something worth training for even as we cross the finish line. Training is the best accountability for runners and you only train when you are signed up for a race. Today, I'm taking inventory. Today, I'm making sure I'm signed up. Darkness fell like a hush; the lights circled us as we circled the fire. The jumping glow splashed on our faces and warmed our autumn skin as we cupped black coffee in thankful hands. The sky speckled with stars and the creatures sang out their evening melodies. And we sat in the front row in the glorious theater of God. After reading Bonhoeffer by Eric Metaxas, we had all carried around conversations that couldn't happen over the phone and couldn't happen half-hearted. This night was set apart to try to understand someone from the great cloud of witnesses - to look at the life of someone who treasured the Lord in such a way that he was ruined for anything else. And we sat in the front row in the glorious theater of God, right there in the backyard of an Iowa farmhouse. The candles glowed in mason jars to light the path from the woodshop, where we enjoyed a bountiful spread of German delights, and inside I was a mess of emotion. A weighty, good mess of gratitude and purpose and joy and hope and pain and fear and defeat and doubt and sorrow. When despair seems simpler and right, stories of hope read more like fiction. But not last night... not when we remembered people whose lives were anchored by one thing, driven by one thing, delighted by one thing ... and not when I looked around at the firelit faces of my friends, whose struggles on stormy seas are anchored deep down by the same greatest treasure. The struggle is not to stay upright, but to rejoice in the anchor which holds us. Bonhoeffer's life was not about making the message of Jesus look good or better or more intellectual than whatever religion his peers and countrymen presented. He was not about being interesting or popular or approachable, at least in the end. Bonhoeffer purposed to be about truth. He set out to know God and to draw others into a knowledge of God as it is revealed in the Word of God. His culture said a lot of things, burned a lot of books, and printed a lot of promotional materials for massive political campaigns... but Bonhoeffer had eyes to shake off the surface storms and cling to the hope that anchored and the only hope that would reveal the evil that had usurped the hearts of his countrymen. This. This is beautiful, I thought. I love how David Hall describes John Calvin's thoughts on our seats in the glorious theater. I went away from the night knowing we hadn't talked about everything, hadn't appreciated history completely, hadn't understood theology thoroughly... but oh so thankful that we showed up at the theater. I'm thankful I have others with whom I can behold the glory of God and I'm thankful for the support we give each other to be unapologetic about truth. Today, I am still purposing to know God, find out what pleases Him, and delight to do those things. And today I am thankful for those I can share steps with along the way. After three years in a place that still claims part of my heart, the move stateside from Honduras was more than culture shock last June. My friends were scattered across the country, each member of my family was plugged in to community where they lived, and the mounting pile of rejection letters made the job market look as grim as everyone said. I don't know what I expected, but it wasn't that. Oh, I wasn't upset or depressed, but the summer days turning into fall were, every one, a surprise. And every day I noticed someone rooting for me. It happened when I would farm talk with my uncle as I rode in the tractor or when my mom would arrange a special outing or when my dad would come home with new ideas he'd been churning all day in the car. It happened when I visited my friends in Chicago or Michigan or California or Pennsylvania or New York and it happened when I reached for reception in my front yard to hear from far away kindred spirits. It happened when I stepped in to the lives of others and they listened, encouraged, and prayed. And "rooting" still seems to be a great word for the way my family and friends support me. I'm living with my aunt and uncle and they have "rooting for you" down to an art form. I've watched them do it with so many people in their lives - listen, encourage, and then root like they're going to get a kickback from others' success. So, I write a blog. I don't make it a big deal, but I absolutely love doing it. I love thinking through the ideas while I run, being inspired while I'm driving, and sitting down to pound the keys into the shape of a blog post. I love it. Though I do not hold it against people who aren't avid blog readers (I get it, seriously), there is something very special about hearing your aunt or uncle say, "Well, you know Caroline blogs, right? You can get them sent straight to your email if you sign up!" I've been kind of grafted in to my aunt and uncle's family and they've become some of my loudest fans. They root with prayers, networking, career ideas, dinner parties, weekend plans, and late night life talks. They are rooting for me to run the race marked out for me with eyes fixed on the Author and Perfector of my faith. I think that this is true community - rooting for others to win. And the rooting is not because we're looking to benefit, but because we are so excited about what the Lord could do with someone's life. I'll tell you, being on the receiving end of the cheers is motivation enough to try and try again when success is slippery. Today, I put on my über hip (but less than hipster) tortoise shell glasses with the confidence of someone who needs corrective lenses and wears them with style. Just to be clear, I think glasses for fashion only is silly and a waste of money. If you do have to purchase glasses, then making it a fashion statement is a bonus. But why am I talking about fashion, which is so clearly out of my realm of expertise? Because I bought my glasses online at Zenni Optical - which was WAY cooler than Factory Eyeglass Outlet, where my parents would take us to get glasses when we were growing up. Here's the cold, hard fact: glasses are crazy expensive! You could pay up to $400 for glasses and that was $350 above my parents' price range. You might assume I've really moved up in the world and am able to buy a $400 status symbol, but I haven't. Actually, $400 glasses are about $375 above my price range and I'm now very thankful for those extra dollars my parents were able to spend on "any pair with the yellow sticker, sweetie." I heard about Zenni Optical from my friend Tina who heard about it from my sister, who googled cheap eyeglasses and then told everyone about her experience. It seems fake at first - almost like a really horrible practical joke because the price for a pair of sweet, hip lenses from their website is as low as $6.95. I know, I didn't believe it either. But then they arrived in the mail and you couldn't pay me to NOT advertise for them. People would say, "Oh, your glasses are so cool!" and I'd always touch the corner, real studious like, and say with a shrug, "Oh, these? $12.00." No one believes me at first, but eventually I get them to write down the website and promise to look it up for themselves. At $12, you can afford to buy 2 or 3 pairs just in case one breaks. And, if you lose a pair, you just skip going to the theatre and you've evened things up for your wallet! Zenni has since really snazzed up their website and have a feature where you can virtually try on glasses to see how they look on your face. I haven't ordered a pair in several years, but I still get excited at the idea of someone else getting a good product for a good price. And why all this about my glasses? Because I read this article about the human referral effect in Forbes magazine that highlights another eyeglass outfitter who is committed to giving quality for a fair price. The author of the article, Alexander Taub (Iowa native, btw) talks about his Warby Parker purchase and the chain reaction of referrals that followed. Bottom line: we like to point people in the direction of something wonderful... and not just the possibility of something wonderful, but the guarantee of something wonderful. I love this idea. I love that humanity is a fan of guaranteed wonderful things and that we want other people to have guaranteed wonderful things too. I love that the human referral effect happens and that it happens so often and that Forbes magazine is taking notice. What I wonder is if eyeglasses are the only thing we should be sending down this highly effective human pipeline. I wonder if this human referral effect is being extremely under utilized. I wonder what would be the best thing for humans to refer to one another? “The heart is deceitful above all things, and desperately wicked: who can know it?” Jer. 17:9. Learn much of the Lord Jesus. For every look at yourself, take ten looks at Christ. He is altogether lovely. Such infinite majesty, and yet such meekness and grace, and all for sinners, even the chief! Live much in the smiles of God. Bask in his beams. Feel his all-seeing eye settled on you in love, and repose in his almighty arms . . . Let your soul be filled with a heart-ravishing sense of the sweetness and excellency of Christ and all that is in Him. Let the Holy Spirit fill every chamber of your heart; and so there will be no room for folly, or the world, or Satan, or the flesh." Oh, and how grateful I am that we can know this love! How ready I am to "live much in the smiles of God" and "bask in his beams." This kind of delight in the Lord not only purifies, but it also protects and perseveres. When all our delight is found in the One whose love and joy can never be exhausted, we are always safe and always secure. We are swept up into celebration and nestled into the friendliest nook - in the cleft of the Rock. When all our delight is found in Christ, we dance as David - unashamed and giddy with praise in front of the Lord. When all our delight is in the Lord, all our despair and defeat are drowned out. And, you've never seen such perseverance as Christ-drenched delight. Christ, the image of the invisible God who holds all things together and in whom all the fullness of God was pleased to dwell (Colossians 1), has made a way for me through the blood of the cross. I can never run far enough to forget this delight - this deep gladness of rescue and this gift of new life. The delight chases me with thunderstorms and children's smiles and the taste of a homemade, family dinner. This delight pushes out from every corner of my soul and expands it, leaving no room for sin or folly or Satan. This delight perseveres to consume a life, even the life where wickedness once reigned. This delight that purifies, protects, and perseveres is as steadfast as a one hundred-year-old oak tree. Today, I'm resting in its shade with thanks enough for one hundred years. We were sitting around a crowded table at the youth offices with plastic plates piled with Abbey's ciabatta pesto creation and various other potluck offerings. Our Bibles and devotionals and journals were all spread open in the mix of things and we were talking about how Jesus learned things. He studied the Scriptures and realized what it was He was supposed to do. As he learned, he obeyed by submitting to what was prophesied about Him. Jesus learned things. Doesn't that sound crazy? It could have been all the banana bread baking or the fumes of a newly refinished gym floor a few doors down, but as the realization settled in, we wrestled. We tried to make sense of Jesus being human - learning things from the Lord and learning things about life that he didn't know before. We wrestled through the possibility of another human obeying perfectly and submitting to the Father's will. Yes, we know it's not possible. We know that Jesus fulfilled the law. But, we thought about it. We wrestled. 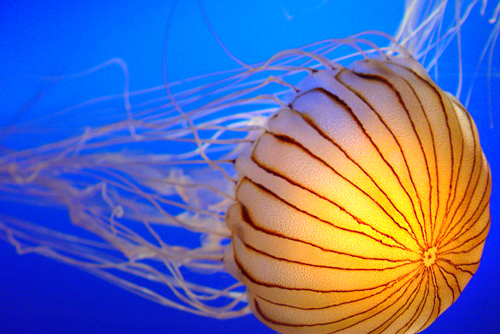 Sometimes, when we seek hard after the Lord in Scripture ... sometimes it's like wrestling a jellyfish. They looked back at me blankly while the picture played in their minds. I probably should have, but I didn't take it back, because I really do think that our searching sometimes feels slippery and even that sometimes we are surprised by what we find. Sometimes answers seem illusive or strange and sometimes they sting. But, we're drawn into that wrestling match because there's something incredibly beautiful about knowing more of something so wonderful. Yes, the analogy breaks down, as all analogies do. But, until someone gives me a good reason not to, I'll keep wrestling the jellyfish as I seek to know more about my Savior, to find out what pleases Him, and then delight to do those things. I do forget. I forget that loving as Christ means hating what stands in opposition. "Hate" sounds unpopular. It sounds... mean. But when I forget to develop a healthy hate for my sin, I make friends with destruction. When I forget to develop a healthy hate for the sin in others, I lead friends to destruction. And in all this, I am finding what it means to cling. In the strange unsteady that rocks my boat today, I am learning to cling like my life depends on my grip. My desperate hold is always rewarded by the unfaltering strong arms of my Redeemer, who reminds me my life depends on His strength. In a few weeks, I'll sit around a table of delicious German food with some of my closest friends to discuss a true story of transformation, tragedy, and terror. We're going to discuss a book about a life - the life of a man who would not tolerate a theology that would wipe out a race of people. Reading the book, Bonhoeffer by Eric Metaxas, a few years ago was terrifying. I had walked inside the gates at Auschwitz in Poland and seen the incinerators; I had stood in the tower and looked across the field of long buildings built for suffering and death. The account of this brilliant German man with the right pedigree and the right education and the right friends is ugly in its revealing of everything wrong about the world... about the human condition... about everything culture slowly and slyly considers "right" without question. But book clubs with biographies are meant to focus on the past, to stir up nostalgia or pride or gratitude that terrible times had such wonderful people to overcome them. So why is The New York Times making me nervous today? Why do I think Bonhoeffer's words would ring as poignant today, in our much progressed culture of tolerance? Why does today seem so terrible? I have to read the news in waves - a little bit here, a bit there... some in the morning and some over lunch. Because it feels ominous. A sliver of a column on the front page was dedicated to the continuing conflict in Syria while a lion and her cubs enjoyed a photo and feature further down on the page. Zoos are having trouble deciding what to do when babies "don't fit the plan." I guess those babies were part of, "All the news that's fit to print" in a more prominent sense than the failure of any diplomatic, peaceful measures by Annan in the battered and bruised country of Syria. This probably reads like a jumbled jigsaw puzzle and that's because it is. I know I've got a hope secure and I know I've got to share this message, but is this world making anyone else nervous? When I sit around that table in a few weeks, enjoying good German food with kindred spirits, I have a feeling they'll know exactly what I mean. I was talking with my brother tonight (in the moments I could peel my eyes from the USA women's gymnastics team) and he said something that dropped like granite over the cell phone waves. "Care, it's like the world has lost its integrity. What do we even do about that?" We were talking about health insurance and welfare and the spirit of entitlement and somehow we got around to integrity. That was when my brother told me that the world doesn't have any - it's lost. I don't know if I said it like this, but I thought it, "Yes, the world has no integrity... but I wonder if what we do is, with the power only our salvation provides, what we do is have integrity." We can't change systems or government structures or the way both can be manipulated by 'entitled' people. We can, however, be people of integrity who are transformed by the power of a structure outside of earthly invention. We can offer an honest handshake in an honest business deal because we are not governed by earthly ambitions. Not because we are so great or enlightened or advanced, but because God is so great. Because God is so great (and gracious), the world has hope of integrity. Because God is so great, our disgrace does not have to be the end of us. Because God is so great, integrity can be found. It's hard for me to imagine someone who welcomes death and darkness like I welcome light and love - someone who longs to be in utter, distant loneliness forever. There are such people and Cormac McCarthy introduced me to one such person last night in his screenplay, "The Sunset Limited," an HBO film. The entire film takes place in a cramped apartment where two men take ahold of the other's worldview by the collar and give it a thorough shaking. Their lives could not read more opposite, but their human-ness keeps them in a wordy banter between death and life. Several times it felt like the wind got knocked clean out my lungs, so direct was the attack on the anchor to which my soul is bound. After Black (played by Samuel L. Jackson) rescued him from a suicide attempt, White (played by Tommy Lee Jones) refuses to give up hope on one thing: giving up. He plans to end his life and finally find peace in the nothingness - the void, dark, solitary space beyond. Everything he valued in life as a respected professor revealed itself as an illusion and in his 'enlightened' state the only logical response was suicide. The despair was palpable as White spoke - like death's bony hand had already strangled the life out of him, twisting up his insides. When his eyes attempt to betray the death in his soul, his words pound harder the nails on his vacant coffin. Emptiness. Black (Jackson) is a man of conviction and a self-proclaimed 'outlaw' when it comes to faith. He lives in a rough tenement, surrounded by junkies and crackheads, and claims to not have a single thought apart from his Bible knowledge. He lives simply, available and eager to be used by God in the lives of broken people. And White (Jones) would have nothing to do with his charity. With the striking boldness of a man who has seen death battle in front of him all his life, Black debates the meaning of life with White (and on several occasions requests an everyman paraphrase). Though we are pulled this way and that, the end of the film closes without resolution. We suppose that White left the same man who walked into the shabby room, a pending suicide statistic. We suppose that, though Black is shaken, he remains faithful to the God who took him down to the train tracks the night before. Black suggests that if White's life has brought him to make such a terminal decision as suicide, then he's come to the end of himself. If there is nothing to salvage (nothing except death itself holds meaning), what could be lost in starting over but that which could be gained by starting over? When White responds with probably the most horrifying monologue of the entire film, we can almost taste the human depravity as it drips off his lips. Void. Cold. Death. And the viewer must decide what or who is capable of arranging the unraveled strands into something meaningful. The viewer must battle with his own demons and despairs when everything is shaken free of its settled skin. The viewer must decide if he is the anchor or if the anchor is deeper than his frail, human skin. Well, here are some links I'm rolling out on this Tuesday. I'm dragging my feet a bit, but I've got to run before I lose motivation. Check these things out, friends, and let me know what you think. When I was growing up, I would pull out classical bundles of music from the shelves in the piano room and ask my mom to play. She would always say, "Oh, honey... it's been so long. I don't even know if I can play this anymore..." but I could always tell she'd give in to my request and let dinner or the dishes or the laundry wait a few minutes so we could revel in the classics. This piece from BrainPickings, "Tchaikovsky on Work Ethic vs. Inspiration" brings me back to those moments in the music room, but not just because my mom worked hard at being a musician. Also because she worked hard at being a mom - inspiration came in both cases as a result of her work. This post is about a letter Tchaikovsky wrote to his benefactress and the whole thing is beautiful - please go read it! Sometimes I don't understand art, I'll admit. But, maybe it's the philosopher in me that loves what art says about who we are as a culture. Artists (and curators) kind of get to play the music that contemporary culture writes as it defines itself through values and norms. So, this piece in the NYT, "The Fine Art of Being a Curator" struck me because of what it means for the music. Ahem.. So, if culture decides what is important right now, artists translate those things to canvas, buildings, statues, etc., then curators get to decide what does the best job of playing the music. Maybe this is another post in the making. The article is really very straightforward - talks about how curators are becoming more established as a field. I just can't help but ask, "Who sets the standards for good art?" But that's probably because I'm not, "in the know" about these kinds of things. What would you say if a doctor told you that you had a brain defect that saved your life? That's nearly what happened for a young Aurora woman after she was shot at the theatre during the Dark Knight premiere. Read the story here, "A Smiling Providence in Aurora, Colorado" from Denny Burk. I love books and I love libraries - this post takes us inside the libraries of famous writers and I have to stop myself from drooling. Each nook looks so dreamy! That's all for now. I'm going to go pound the pavement on a night run. Talk of the economy and taxes and 'Greece-is-our-future' can get a sister down, you know? It's not just the old folks who are saying, "What's this world coming to?" No, that phrase is open to all ages because nobody knows anymore and it's a little frightening. Safe to say, everybody is looking for something. Also safe to say, everybody is looking for something to fix whatever's broken. Here's something to sleep on by the Welcome Wagon that might chase away some of those bad dreams.